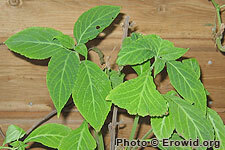 Salvia divinorum is a sprawling perennial herb found in the Sierra Mazatec region of Mexico. Its leaves contain the extremely potent Salvinorin A. It has a history of buccal use as a divinatory psychedelic, and has been widely available since the mid 1990s primarily as a smoked herb. Its effects are considered unpleasant by many people. Does Salvia use show up on drug tests? Is Salvia divinorum going to become illegal? Are salvinorin and THC really "thujone derivatives"?